A local Northern expression which was said to be earlier this year and made me think when was the next one. A bit of research quickly revealed it was 2012 and so I made my arrangements to witness the start of this unique custom. A guild is an organisation of all traders, merchants and craftsmen in the town. Originally established to establish support many went on to monopolise and control all trade in the town. This prevented others from working there and subsequently new comers were frequently not made welcome and rarely became members of the guild. 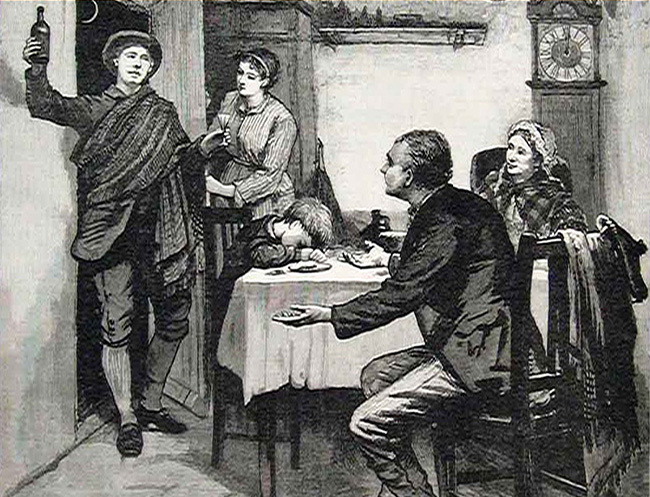 To ensure that the town controlled membership, all members periodically were called to a court where they swore loyalty to the Guild and Mayor. During this they were checked and renewed membership allowing them to trade in the town after giving a fee and then admitted admitted as a Burgess (the special name for its members.) It was soon noticed that the need to renew and check membership would only be needed once a generation and such from 1542 it was held every 20 years. First records of its celebration dates from 1387, but the origins of the custom date from 1179, when the town was given a Royal charter by King Henry II granted Guild was an organisation of traders, craftsmen and merchants. As it had a monopoly of trade in the town and only its members could carry out a craft or business. Newcomers could only trade here with the permission of the Guild, and such approval was not given lightly. 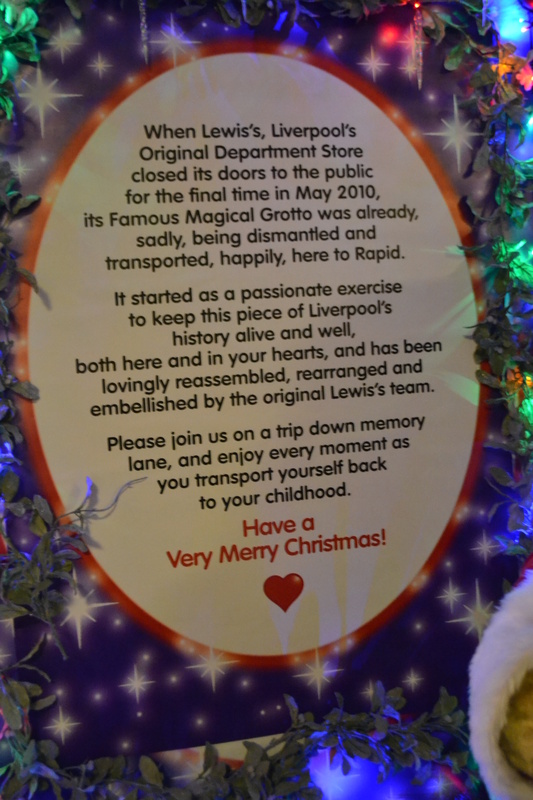 With the renewing of membership being every 20 years soon, this soon became a celebration of the city and people would take the opportunity to meet socially, feast and undertake processions and such it continues today. You knew something was in the air, there was hustle and bustle of people in the town, barriers were being put up and a party of people began to assemble outside the museum where the proclamation was to be read. Unfortunately the height of the museum meant that one could not see that proclamation well although fortunately a large display screen relayed it. 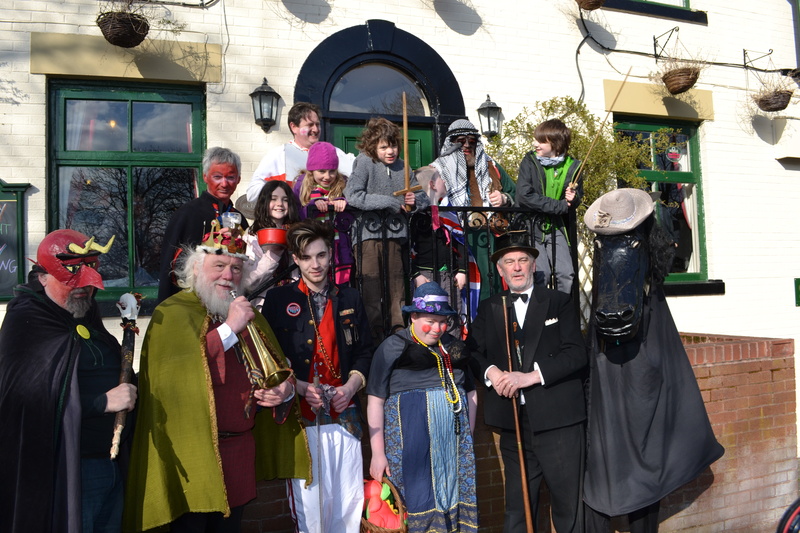 After what seemed to be an age of rather strange lounge music covers of popular rock songs a choir assembled, the burgesses, invited guests, the bell man and of course the Mayor of the Guild. 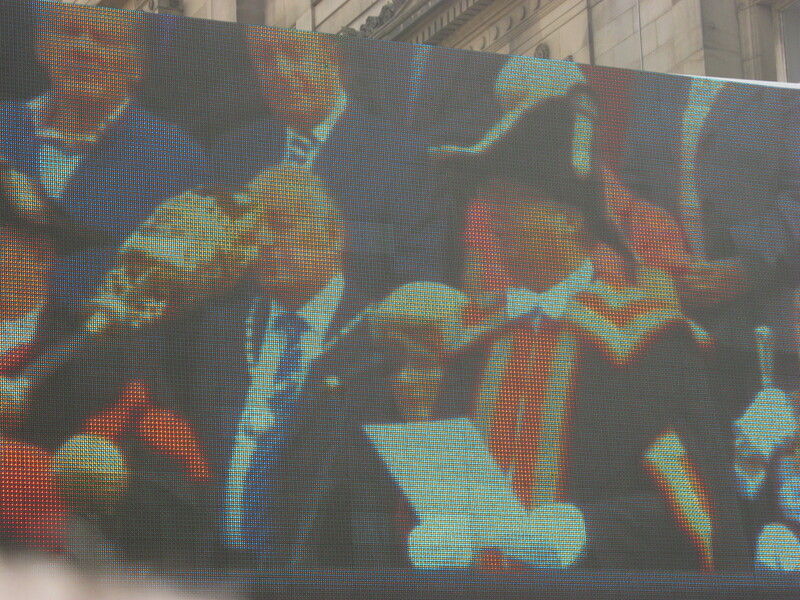 This was a temporary Mayor who oversaw the whole affair and considering how rare the event was a considerable honour. 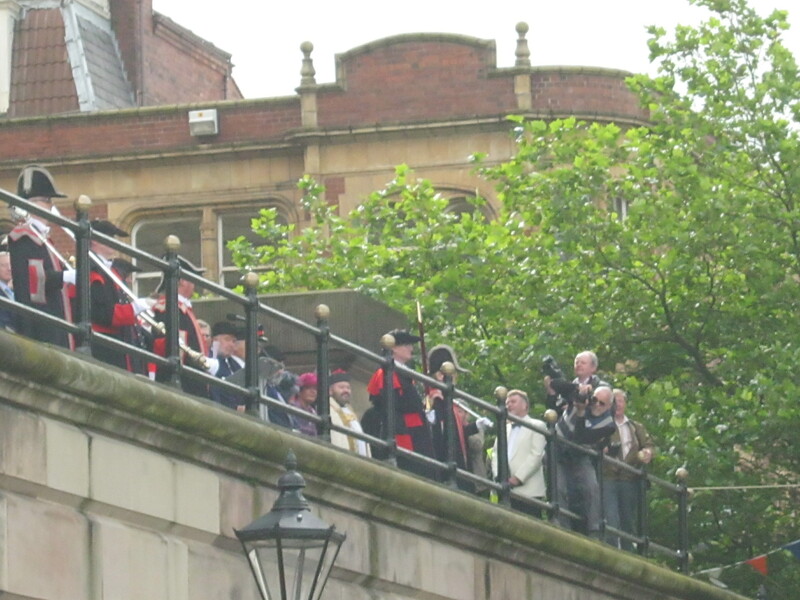 After a delightful rendition of the Guild Hymm sung admirably by the quire and sung well by some in the crowd too, surprisingly considering it cannot be sung more than three or four times in a person’s lifetime, the Mayor was introduced and to cheers the Guild was announced. 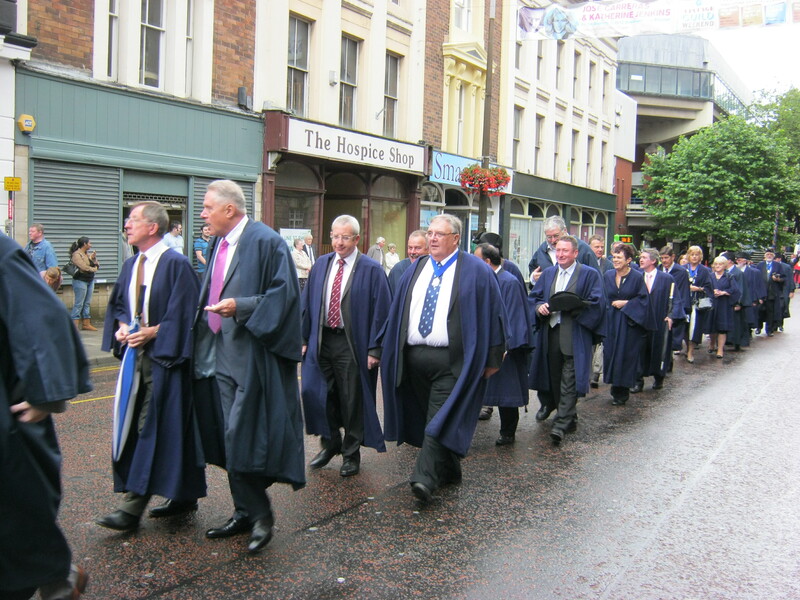 Unsurprisingly, the longest running event associated with the Guild is the Trades Procession. Records suggest it has been undertaken at least since the 1600s. 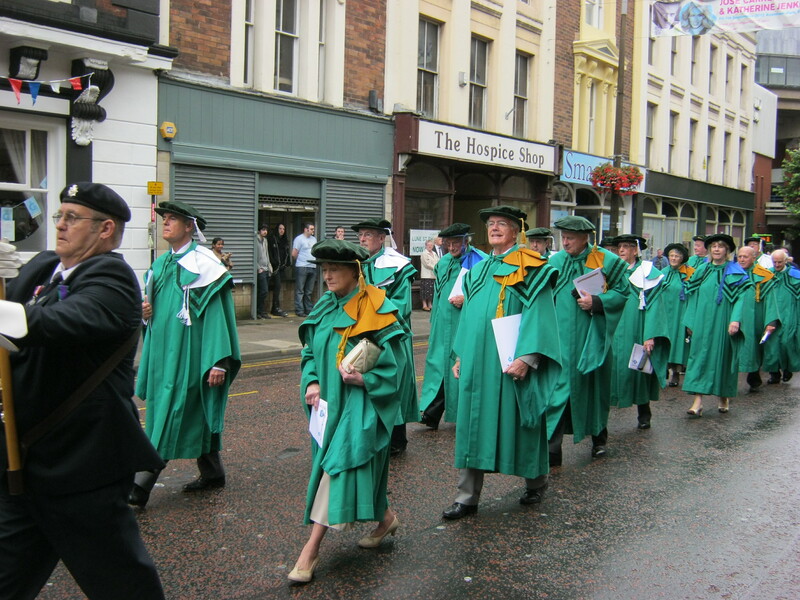 Of course the members in this procession have changed, cotton for example rose in Lancashire in the 19th century but is now defunct, and today along with more traditional trades, are a number which I still was not sure what they did. 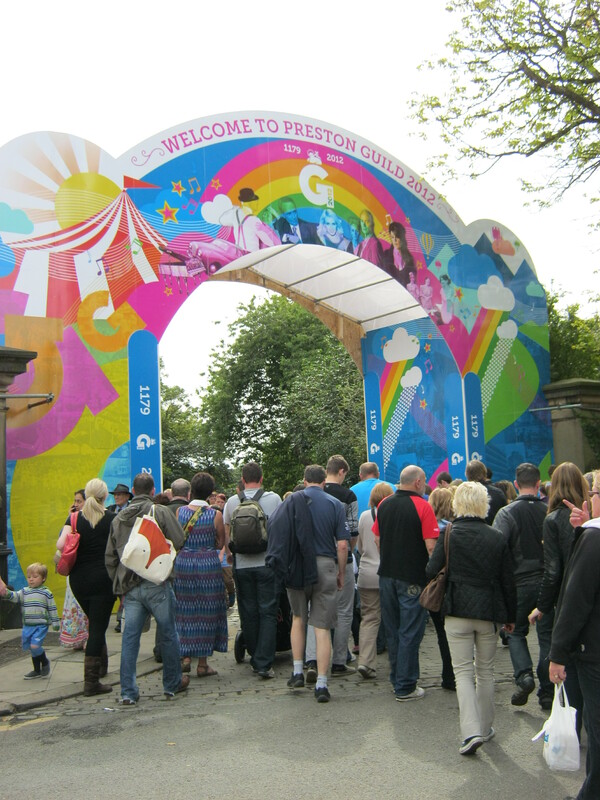 I overheard someone in the crowd say that they thought no-one would be interested in the Guild this year, but clearly Jubilolympic fever had spread and this was clear in the thousands who had congregated to see the procession and final proclamation. 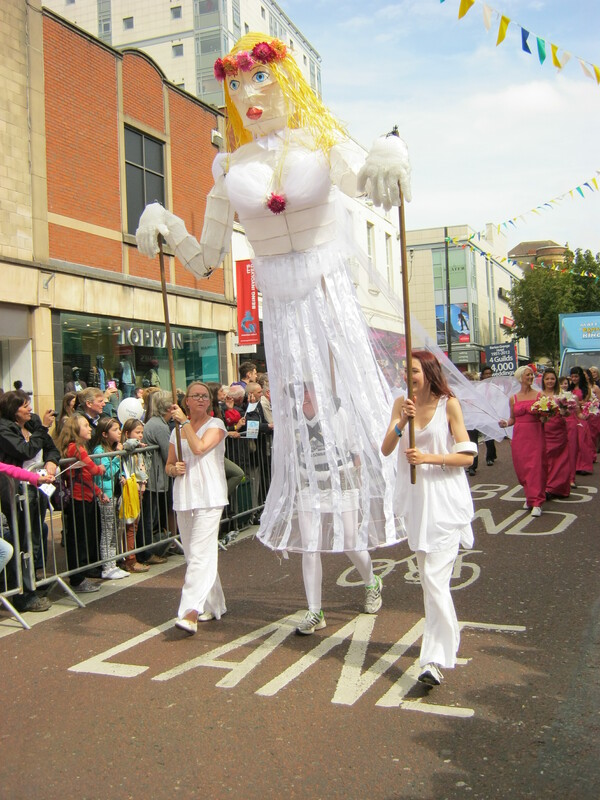 The procession was the largest the Guild had ever done consisting of just under 100 floats and members. 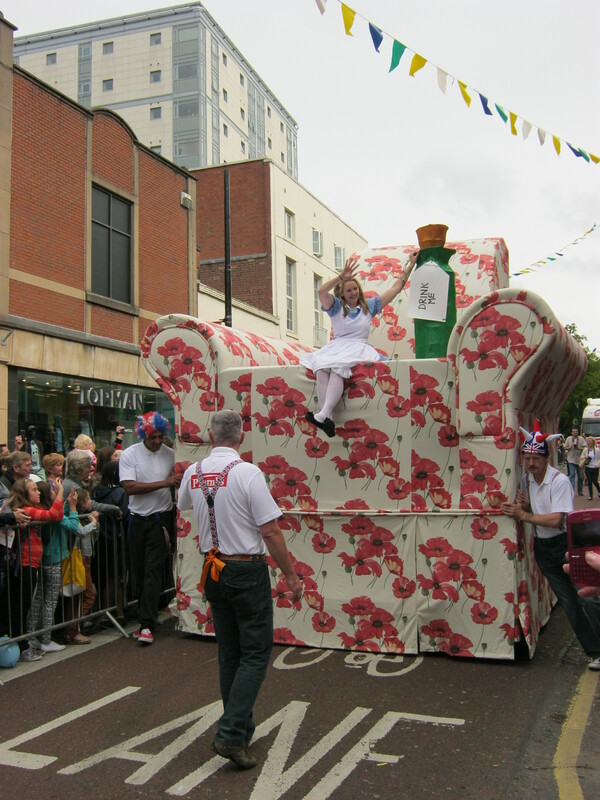 Some had done a considerable amount of effort with people dressed as giant sofas, drinks, a wedding party and one of the largest shopping baskets I have ever seen. 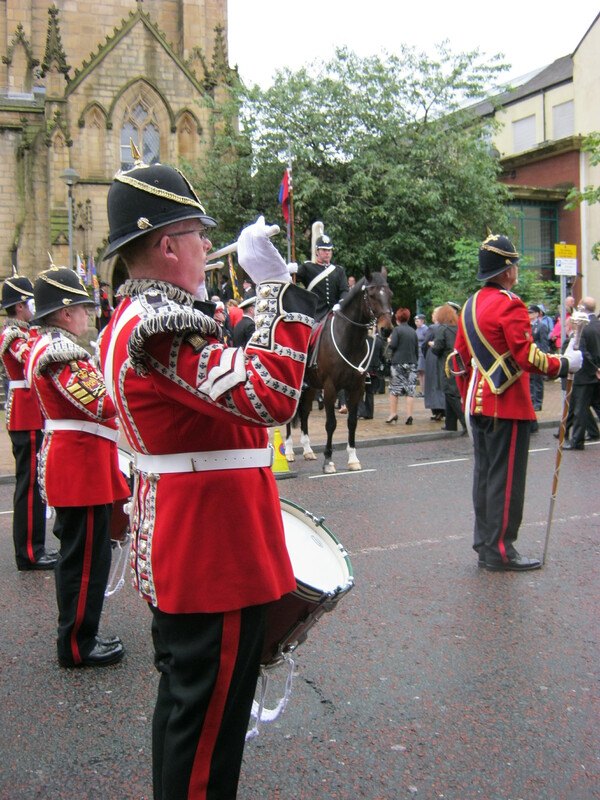 The floats were associated with the stirring sounds of a number of brass bands. 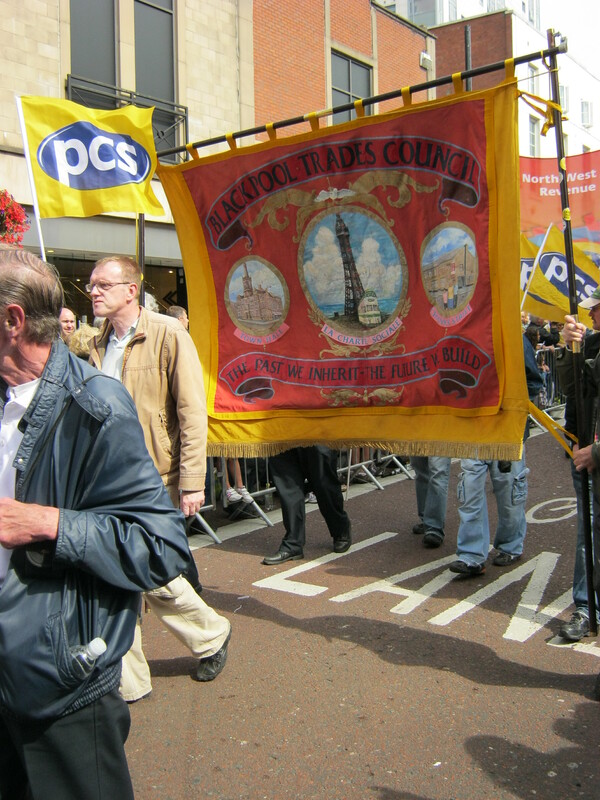 Perhaps the most evocative of processions were the trade unions carrying their vibrant and brilliant banners and underlining still the importance of protecting one’s livelihood in modern times. Free gifts were given out aplenty – balloons, free pencils, free water bottles, sweets, bracelets…when the funeral directors appeared I was worried at what they would hand out for free! The procession continued without break for virtually two hours, a continuous serpent like, through the town. At one point, a lady pushed her head from the back of the crowds and asked for a policeman, everyone thought someone had had an accident but apparently she was asking if there was some way to get across the procession to go to a shop on the other side!!? Entertainment for all-Wot no Rave? As if a time machine had landed in the delightful grounds of Avenham Park, three tents over two nights boasted the ability to take you back to the parties of Guild past. Dance the Charleston in 1922, remember the War with 1942, relive the 70s soul (and especially local specialicity Northern Soul) in 1972 and experience a bit of a mish mash for 1992. Surely 1992s music was the Rave and it was hinted at, but perhaps a Rave all-dayer is a bit too madding for the gentile folk on Preston. The eerie sounds of music past resonated around these parks and back streets like those ghosts of Guild’s past creating a very special atmosphere. Indeed being every 20 years there is a rather melancholic feel to the Guild and these events built rather successfully upon that. 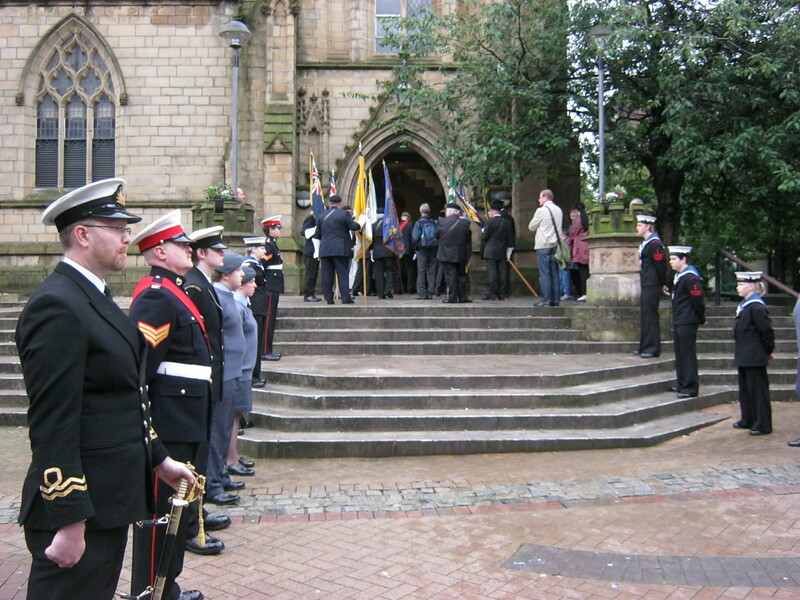 The next day the Guild Mayor and members of the Corporation wore their finest robes of office, attended by trumpeters, mace bearers and sergeants in traditional costume and all the other professions of note in the town, judges and service personnel, process from the Guild Hall to the Minster church to give thanks for the return of the Guild. The spectacle although not as considerable as the Trades procession gave some idea of what the Civic and Church parades of the following week may have been like, as sadly I could not stay to see the Civic, church or torch procession…however, the local press was very complimentary calling it ‘The Best guild ever’ and I for one were very pleased to have been able to get involved. Especially as I may not be around to see the next one. The Saddleworth rush cart is a revived event which follows the formula Old custom+Morris men = revived and more the joyous as a result. Despite the rather pointless nature of what it’s about, afterall do churches need rushes (like does Southwell minster need £12 from the Gate to Southwell). 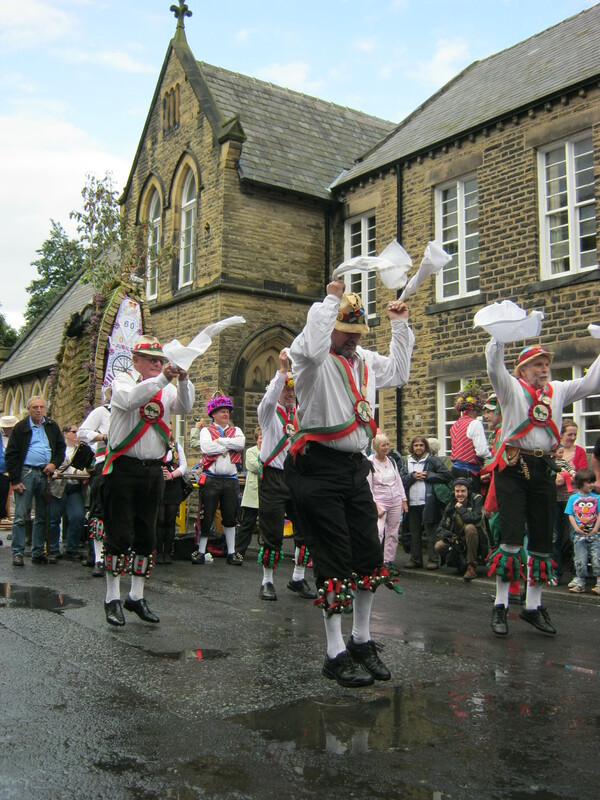 In this case of the moving of Saddleworth into Lancashire from Yorkshire was the catalyst in the 1970s for its revival and celebration. Before modern times, the floors of churches were earth based and so rushes were used to keep them clean, to help make churches smell nice and prevent damage to the knees, these needed to be replaced each year, often at great festivals or the patronal saint’s day. 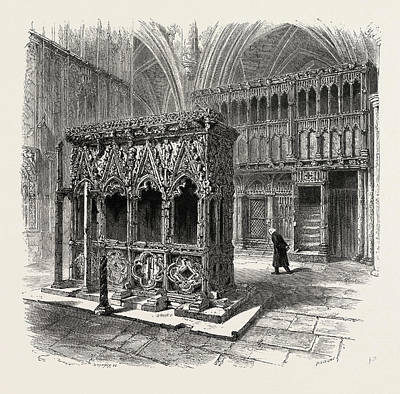 Interestingly, despite being associated with saints and ceremony, neither the Reformation nor the Puritans, nor even the boarding of floors, had any effect on the vigour for the custom and it continued to be popular. 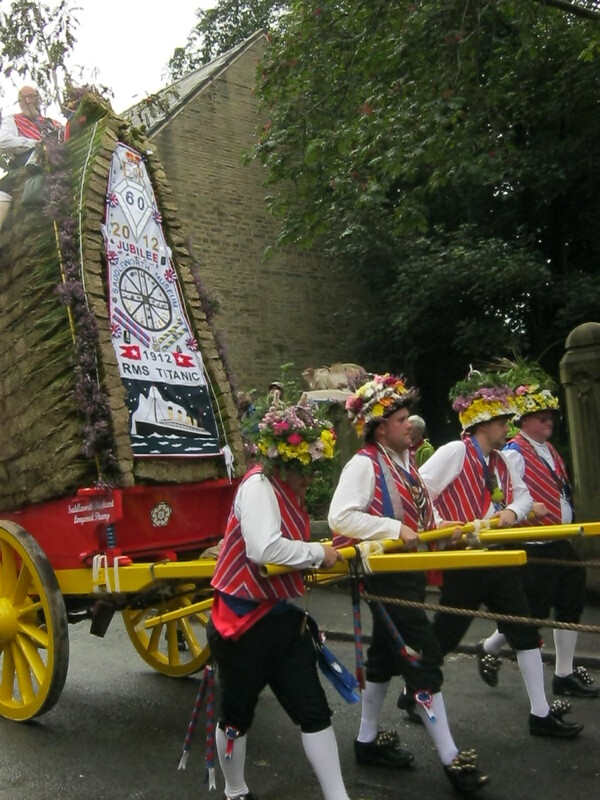 The pomp of the rushbearing reached its pinnacle in the 19th century when green rushes were pyramidically piled with great effort on a two or four wheeled special cart often secured by flower-woven rush ropes, and topped with oaken boughs with patriotic slogans and often silverware seen as luck for the village. 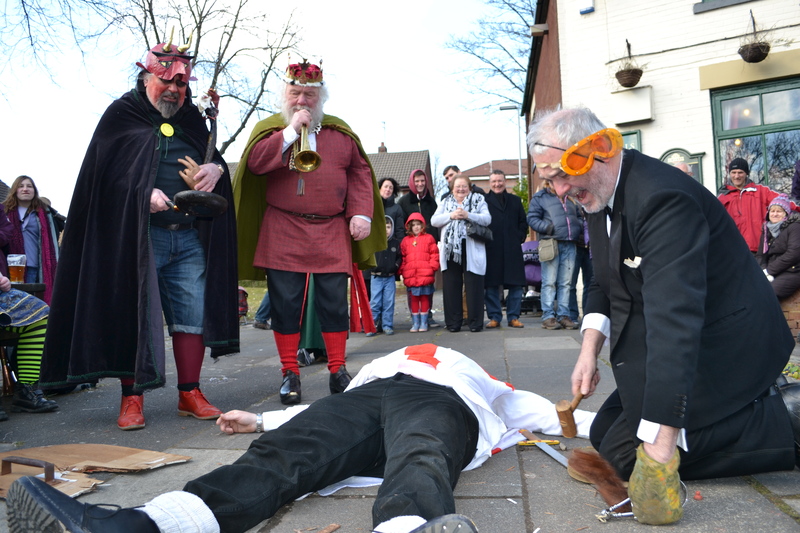 The rush bearing was a great event for the town and such was in some places competitive but in all cases associated with drinking as such the ceremony came to logger heads with the Victorian reformers. In the 1800s, each of the village, Cross, Boothurst, Friezeland, Harrop Dale, Burnedge, Uppermill and Greenfield in the Saddleworth valley had their own carts but now only Saddleworth. As noted Saddleworth was revived in 1974, as a response it is said to the secondment of the region to Lancashire. It is now undertaken in the third weekend of August, often the bank holiday weekend. if you’ve always had a hankering to see Morris dancers and haven’t yet…this is one you must see. Swaths of Morris are involved, only the Thaxted Meet comes near. At first you think that’s it and then more keep coming..and coming…and coming! 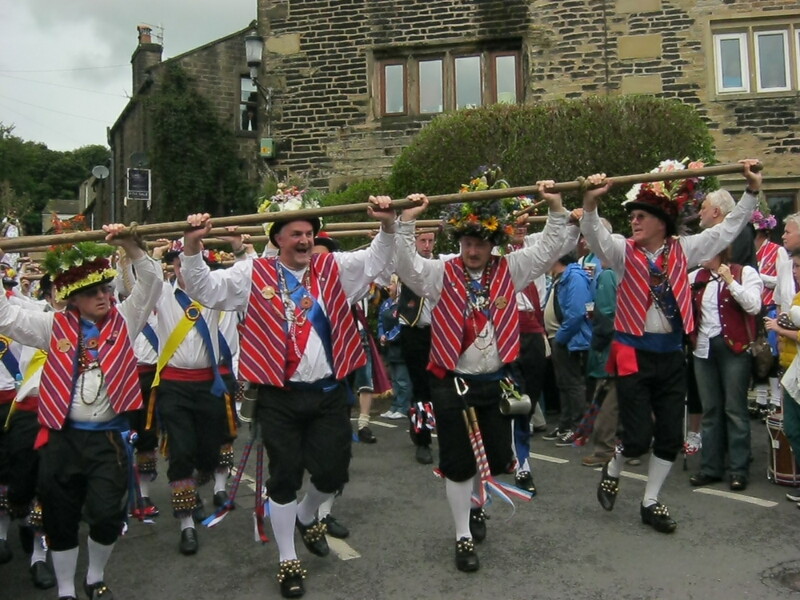 This is then carried by the Saddleworth Morris and teams from all over the country being dragged by Morris holding staves attached to a long pole known as the ‘stang’ pulled around the villages, there are over 40 morris men, in front and behind to stop it going backwards! A wet Saturday was the day chosen, and after being slightly pixyled, by a hold up on the M1. Finally, turning up at Uppermill, which is the central location for the region of Saddleworth and thus the ‘home’ of the cart, I was greeted by the rather surreal vision of every pub, bar, shop, indeed every open space and all along the street, Morris. The sound of the cars being augmented by the chiming of bells and somewhere I could hear the sound of sticks hitting each other. Soon travelling along the street I came across the rushcart resting at the Commercial Inn. 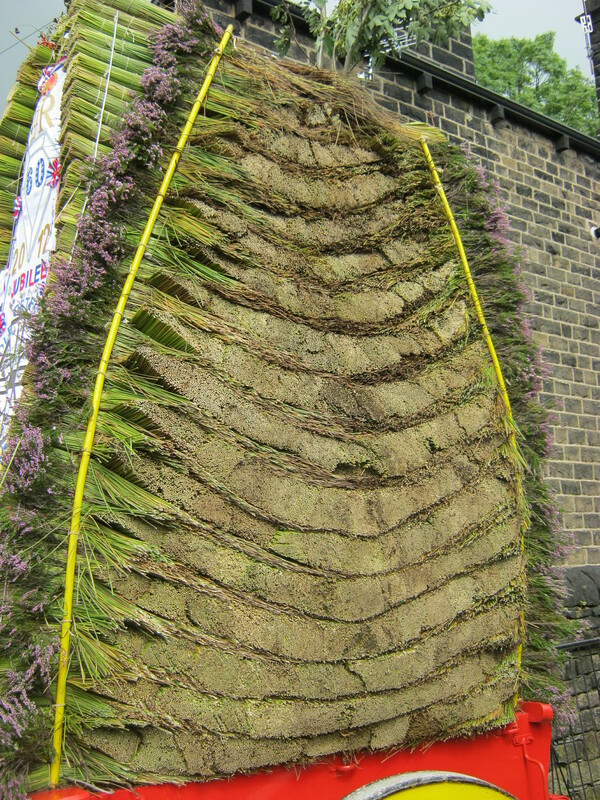 Here was also the Saddleworth Morris, resplendent in their The rushcart was a wonderful and slightly frightening structure, a towering apex of the rushes surmounted by some tree branches, lined with heath, and affixed to one side was the banner this time celebrating the Queen’s Jubilee and Titanic. 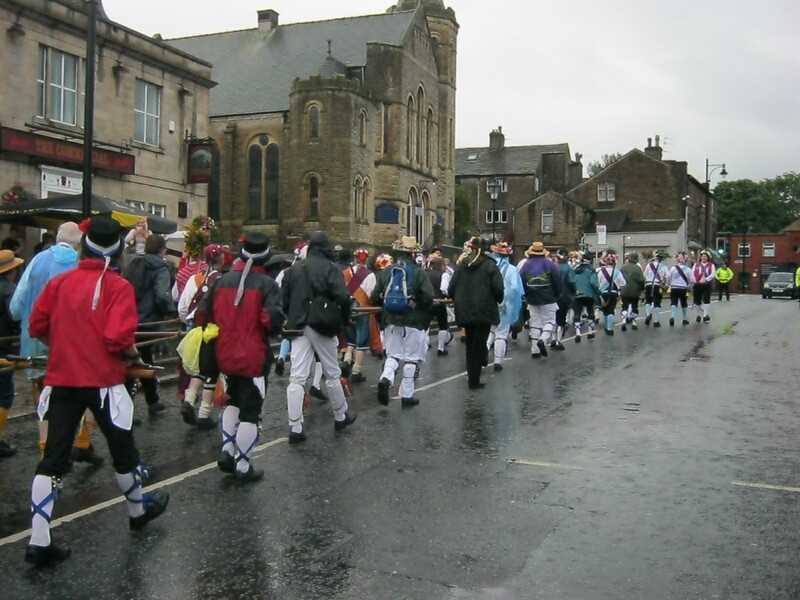 The time approached and soon all the Morris men who were supping elsewhere were congregating at the rush cart. 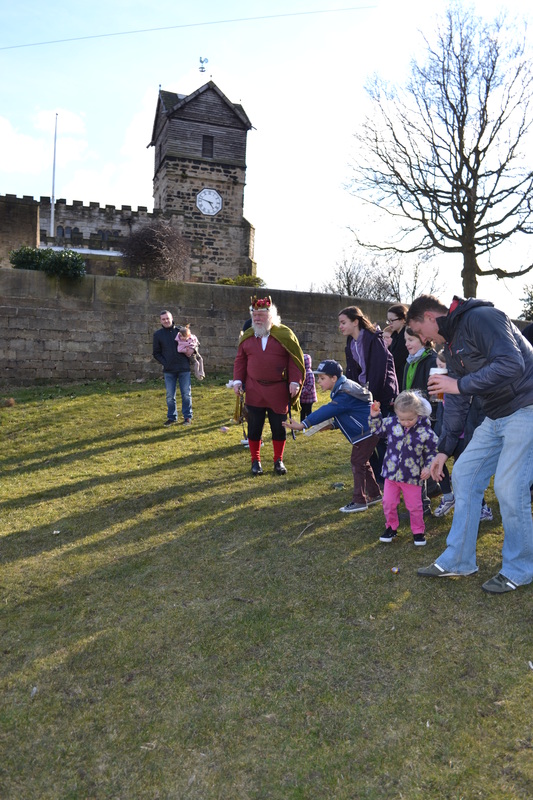 Soon the Rushcart was on its way, atop the towering edifice the oldest Morris dancer, this year from Saddleworth. The speed at which this cart journeyed was at times quite considerable and one could image in the days when people would be unfamiliar with juggernauts it could be quite frightening especially as it sways and jostles in response to the action of the Morris men. I followed the cart through three villages and saw it return triumphantly if a little wet to its home at the Commercial Inn. A ladder was thrown to the side of it and the jockey slowly climbed down and the banner was collected up. It’s job done that day. Like the Gate to Southwell it is a joyous celebration of all that is uniquely English about the Morris tradition, and is a bizarre and wondrous custom.